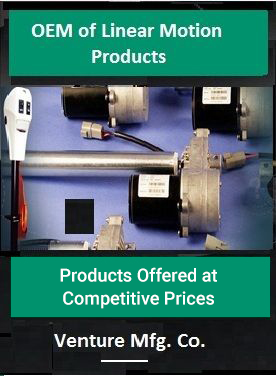 Slide-Out Actuators and It’s Accessories Supplier - Venture Mfg Co.
Venture’s slide out actuator is amongst one of the top most choices for several industrial applications for years; thanks to its excellent operational performance and durable service for long years. Our actuators combine a highly efficient long life ball screw with a DC motor gearbox providing a cost-effective reliable solution for the RV Industry. Available in three gear ratios – 18:1, 28:1 and 58:1 and a multitude of strokes, our Slide Out Actuators satisfy your needs with maximum perfection and efficiency. Whether your application is pertaining to construction or service related areas, this actuator type from Venture offers you the intended results and incomparable performance even without periodic maintenance. 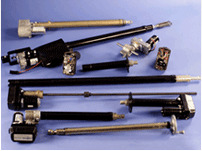 Our patented design allows for easy disassembly of the actuator tube for serviceability if necessary. A brief understanding about the noteworthy features of slide out actuators helps you make an ideal purchase. 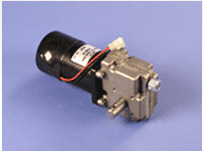 Read on to know more about the significant features/specifications of the actuator type. High Strength steel inner and outer tubes E-coated for excellent corrosion protection. Slide out actuators from venture is yet another example of our excellence in mechanical motion technology and proven designing and engineering capabilities. We have with us a broadest range of highly advanced slide out actuators that are readily available for a wide range of applications in diverse industrial sectors.